Israeli soldiers abducted, on Sunday at dawn, at least six Palestinians, during extensive searches of homes and property in the occupied West Bank. The Palestinians were taken prisoner after the soldiers carried out extensive and violent searches of homes and property, causing excessive damage. In occupied Jerusalem, the soldiers abducted three Palestinians from the al-‘Isawiya town; they have been identified as Amir Shalloudi, Anas Darwish and Yousef Mustafa. In Hebron, in the southern part of the West Bank, the soldiers abducted Ahmad Arafat Gheith. In Qalqilia, in northern West Bank, the soldiers abducted two children, identified as Nidal Salim, 15, and Abdullah ar-Rabie, but released them hours later. In addition, the soldiers abducted a child, identified as Nidal Safwan Salim, 15, from his home in ‘Azzoun town, east of Qalqilia, and Nasser Thieb Odah, 53, from Kafr Thulth town. The soldiers also abducted Mohammad Adnan Tabbal, from Deir al-Ghosoun town, in Tulkarem governorate, in northern West Bank. In related news, the soldiers installed a barbed-wire fence on a road used by local children heading to their schools in Teqoua’ town, east of Bethlehem. It is worth mentioning that the Israeli army said its soldiers have arrested five Palestinians in several parts of the West Bank. It claimed that the soldiers located and confiscated two Carlo rifles, during searches in Hebron, in the southern part of the West Bank, adding that two pipe bombs were hurled at army jeeps in Beit Forik town, east of Nablus, in northern West Bank. Israeli soldiers abducted, on Sunday at dawn, at least five Palestinians, during extensive searches of homes and property in the occupied West Bank. 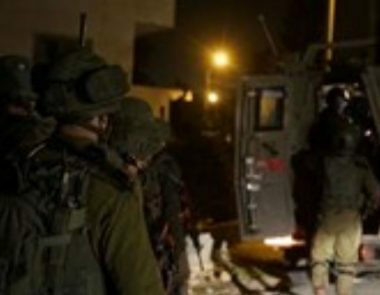 The Tulkarem office of the Palestinian Prisoners’ Society (PPS), in northern West Bank, said the soldiers invaded and searched many homes in Deir al-Ghosoun town, north of the city, and abducted Mohammad Adnan Tabbal. It added that the soldiers also searched many homes, lands and hills, along the roads linking Shweika area in Tulkarem city, with several surrounding communities.